Download the appropriate installer file for your operating system. 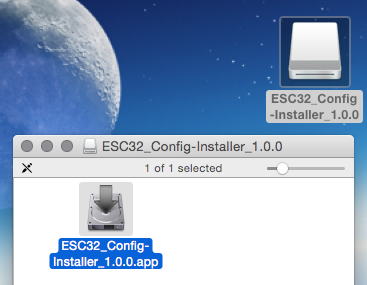 It should be named something like ESC32_Config-Installer_x.y.z.exe (or .dmg for Mac OS X), where x.y.z is the software version number (e.g. “1.0.0”). 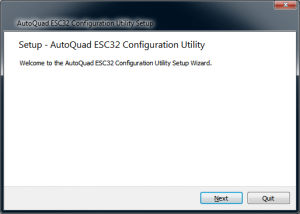 On Windows this will launch the Setup Wizard right away. 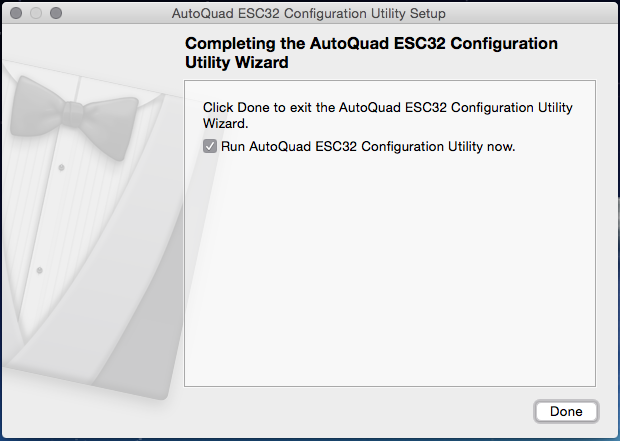 On Mac OS X, this will mount the disk image, after which you will need to run the actual ESC32_Config_Installer.app program found within. Follow the prompts in the Setup Wizard to complete the installation. All options should already have reasonable default values. After installation, you may launch the ECU like any other software by using the shortcuts in the Start -> Programs menu on Windows, or the links in the Applications menu on Mac OS X. New versions of the ECU will be announced on the AQ Forums and in other locations. You may also manually check for updates at any time. 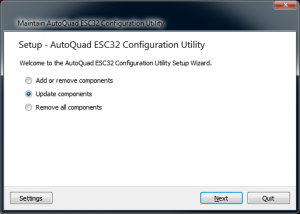 Included with the main software installation is a separate utility program which will automatically check for any available updates, prompt you to install them, then download any necessary files and perform the required update steps. 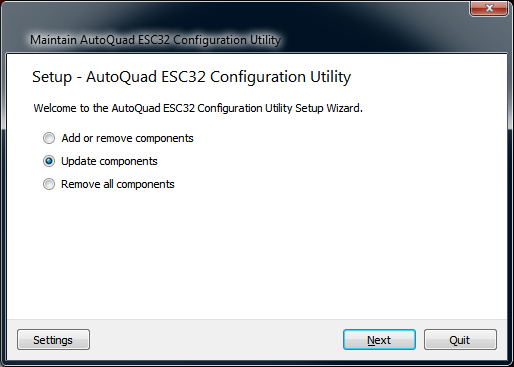 On Windows, there is a shortcut named “Update or Remove ECU” installed alongside the main ECU shortcut in Start -> Programs -> AutoQuad -> ESC32 Configuration Utility. 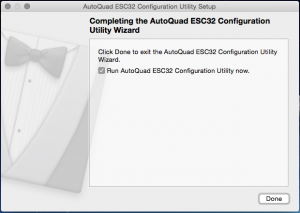 On Mac OS X, the default location is Applications -> AutoQuad -> ESC32 Configuration Utility -> AQ_ECU_Updater.app. After you install the ECU on a computer for the first time, it will be in an unlicensed “evaluation version” state. 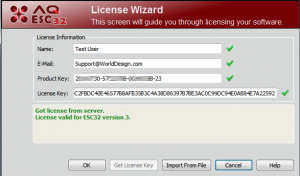 Connecting to an actual ESC requires a valid license. 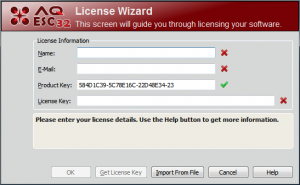 If you are re-installing on a computer which already has/had a licensed copy installed, your license information will carry over to the new installation. For ESC32 v2, you should have received a license registration in the mail when you purchased the software. Attached to this e-mail is a file named License.xml. Save this file somewhere on your local disk, then use the Import From File button of the Wizard to activate the license. 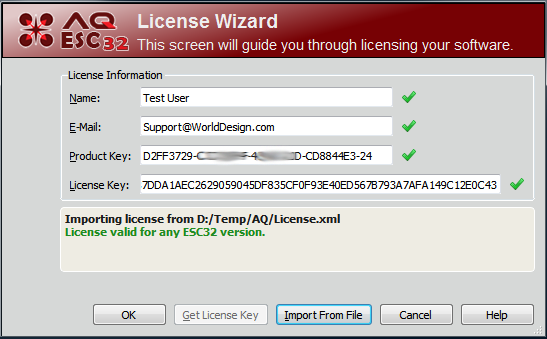 Alternatively, you can also manually copy each piece of information from the license e-mail to the corresponding fields in the Wizard. Product Keys can only be registered once, at which point they become tied to the name and e-mail address used to activate the license (the same Key cannot be used to register under a different name or e-mail). Be sure to use a valid e-mail address when activating a license. This address can be used to retrieve license information at a later date, for example to register the software on another computer. 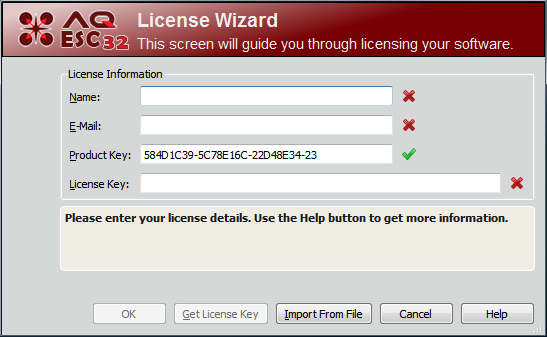 To look up an existing license, or to activate a new license using a Web page instead of the License Wizard, please use the Online Key Generator and Lookup Service. 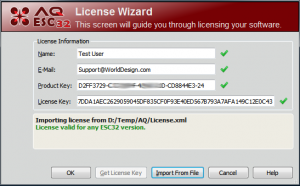 More detailed instructions are available on the License Wizard page. This page was created on 5-Aug-15 by MaxP. Last modified on 26-Aug-15 by MaxP.